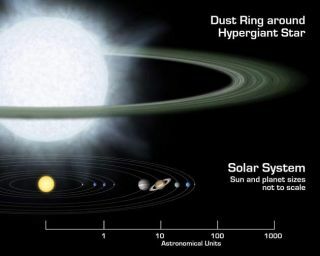 A schematic of one of the hypergiant systems compared in scale to our solar system. Our Sun and planets are individually not to scale (you could not actually see the planets on this scale, because they would be too small). Planets might exist around a blazing hot star so big its diameter exceeds the orbit of Mars, astronomers said today. The star, about 70 times as massive as our Sun, harbors a disk of material that looks strikingly like the planet-forming disks that surround other Sun-like stars. Another star with 30 solar masses also has a disk, new observations reveal. Such disks, made of gas and dust, are thought to provide the raw material for planet formation. Theory holds that the dust sticks to together in clumps, which collide with one another. Some clumps then stick and grow, and eventually asteroids, comets and planets develop. But hot and massive stars generate violent particle winds and intense radiation that theorists previously figured would thwart planet-making. The two newfound disks contain sand-like silicates, which are the building blocks of the planet-growing process. One of the disks also shows signs of clumping. Scientists said the disks may have already formed planets, or could be in the process of doing so. "These extremely massive stars are tremendously hot and bright and have very strong winds, making the job of building planets difficult," said study leader Joel Kastner of the Rochester Institute of Technology. "Our data suggest that the planet-forming process may be hardier than previously believed, occurring around even the most massive stars that nature produces." The discoveries, made with NASA's Spitzer Space Telescope, are detailed in the Feb. 10 issue of Astrophysical Journal Letters. The disks around the two fat stars might in fact be leftovers of the planet-formation process, Kastner and his colleagues said. The outer reaches of our solar system contains a leftover disk of dust, comets and other debris known as the Kuiper Belt. The new observations greatly expand the size range of stars that have disks. Disks have previously been detected around stars up to five solar masses. And last year Spitzer revealed a disk around a small, failed star called a brown dwarf. That dim object has just 0.008 times the mass of the Sun. The orbiting Spitzer observatory detects infrared radiation, revealing heat emitted or reflected by dust, gas and objects. The stars in the study, catalogued as R 66 and R 126, reside in the Large Magellanic Cloud, a close neighbor of our Milky Way Galaxy. Their disks look to contain 10 times more material than the Kuiper Belt. If there are any planets, they won't last long. Massive stars live short lives and die explosively. While our Sun is middle-aged at about 4.6 billion years, R 66 and R 126 will each go supernova within a few million years. "We do not know if planets like those in our solar system are able to form in the highly energetic, dynamic environment of these massive stars, but if they could, their existence would be a short and exciting one," said Charles Beichman, an astronomer at NASA's Jet Propulsion Laboratory and the California Institute of Technology.